A gunite pool comes with a number of different benefits. With gunite pool installation, you can choose the shape and size of the design to fit into your landscape and you don’t have to redesign your landscape to fit the pool. These pools are easier to construct than concrete and concrete pools take longer to install. It’s much easier to add amenities to gunite pools, since they can be made to any shape and depth. Owners can get creative with their amenities and include built-in bar stools, a tanning area, and underwater benches. One of the biggest benefits of gunite pools is that they are built to last and are the most durable pools on the market. Since this pool is built to last, you want to make sure it’s energy efficient. There are a number of reasons why you would want your gunite pool to be energy efficient. Savings: By making your gunite pool more energy efficient by using a pool cover and variable speed pumps, you can keep your pool warm and reduce energy costs. This allows you to save money on electric bills. Conserve Water: By using a cover to make your pool more energy efficient, you can slow the rate of evaporation and your swimming pool contractor will have to use less chemicals to keep the water clean. Rebates: Energy efficient pool equipment can also come with rebates and incentives, which save you even more money in the long run. By buying the right equipment and practicing an energy efficient maintenance routine, you can help make sure that your gunite pool is built with these benefits in mind. Use Timers for the Heater and Pump: By using timers, this will make them work in short cycles instead of nonstop operation and use less energy. Use Solar Energy: Solar energy can help cut down on heating costs but still give you comfortable water. Using solar energy is one of the most cost effective ways to help heat a pool and be energy efficient. Your swimming pool should be built in a spot that is well exposed to sunlight. You can also evaluate the wind directions that are popular and if there are any particular structures that could bring a windbreak. Use a Pool Cover: A pool cover will help conserve heat but also conserve water that can be lost by evaporation. A cover can keep your swimming pool about 10 degrees warmer, which will lower your heating costs. A cover also helps keep your pool water cleaner, which reduces cleanup expenses and will make it so your filter doesn’t have to run as often. With your filter not running as often, you can also be more energy efficient overall. Maintain the Cleaning System: Even the cleaning system does need a little cleaning every once in a while. Pool builders can offer maintenance plans to check the cleaning system to make sure it’s operating and in working order at max efficiently. A system that is in top working order will clean more efficiently and allow you to have more use of your pool. Install LED Lighting: LED lights an save you 80% more than incandescent lights and will last three times as long, giving you energy efficient savings as well as savings on replacement bulbs. Automate Pool Operations: Technology has made it easier to automate many of the pool operations. By automating these operations, you can be come more energy efficient and help optimize your energy use. Optimize the Plumbing: Pipes that are too narrow can cause the pump system to work harder than it has to. 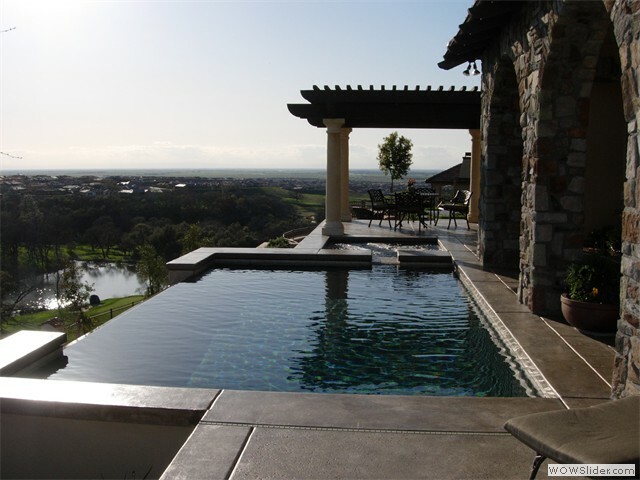 A swimming pool builder in Sacramento can help you build a gunite pool that is energy efficient and give you enjoyment for years to come.